HAI PHONG (VNS) — A programme to support communities in the disaster-affected areas of Dien Bien Province, Hai Phong City and Tien Giang Province was launched today. The three-year programme aims to increase the disaster preparedness and resilience of 6,000 vulnerable children and 30,000 community members. 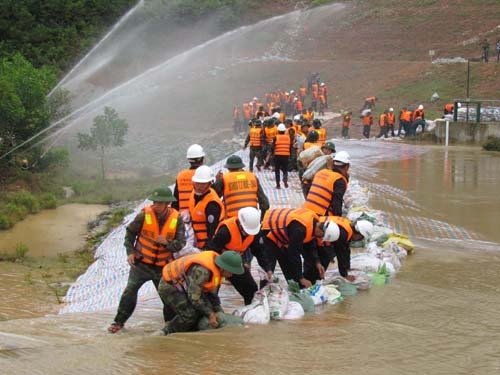 The Disaster Risk Reduction (DRR) in Viet Nam project aims to improve the safety of 12 schools and to reduce the risk and impacts of disasters through providing training for teachers and children on disaster preparedness and methods to reduce the consequences of disasters. The project will also support communities in organising disaster-prevention drills and developing plans for better resilience, as well as advocating for the use of risk-reduction education in communities and schools. The project will be funded by the Prudence Foundation and implemented by Save the Children in coordination with the Ministry of Education and provincial centers for flood and storm control from 2015 to 2017.